Remember back to those Balsamic Roasted Tomatoes and Onions that I posted a few weeks ago? In that post I said that I started using the tomatoes in some dishes. This Orzo with Balsamic Tomatoes and Basil is one of the dishes that I regularly use those yummy tomatoes in. I love the fresh and bold flavors of the balsamic and basil in this. I’ve made this Orzo dish several times. It’s great for lunches; I just throw in a little tofu or chicken (for the husband). I love the lunch containers like you see in the photo above. Either glass or ceramic, they don’t stain or discolor the way plastic ones do. I have a bunch of these containers now, and we use them all the time. I also like that they’re sturdier, so it feels like more of a special treat as you eat lunch, and not just some boring old thing. This Orzo with Balsamic Tomatoes and Basil is also great as a quick and easy side dish for dinner. The recipe is a great starting place as well. I’ve added some sautéed mushrooms to the mix on occasion. You could toss in some Parmesan cheese as well. Add in your family’s favorite veggies. It’s all good. Heat a skillet over medium heat. Add olive oil to pan. Add tomatoes, pine nuts, and garlic powder; cook 2 minutes. Stir in orzo, basil, pepper, and salt. 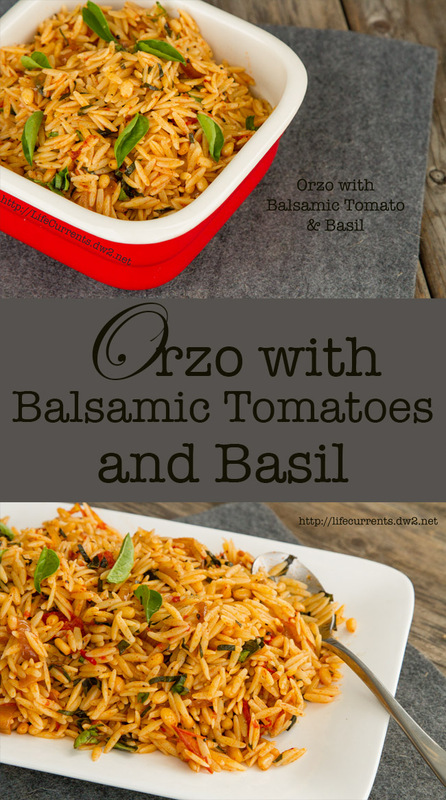 Excellent combination, I love all the mediterranean flavors happening here and I LOVE orzo!! It looks so pretty too! I’m not sure what orzo is. I have never heard of it. It looks like rice? Beautiful Debi! What a perfect idea to use your gorgeous roasted tomatoes! I want to make a batch of this, then eat if for lunch during the week – delicious and healthy! Hi Robin! Orzo is actually pasta. I’ve seen it in all kinds of pasta too, from whole wheat to regular to Gluten-free. Give it a try! I really like it. This looks so healthy and tasty. Definitely a new recipe I’d love to try! This looks like a lovely, tasty and easy to make dish! Yum! Now I’m going to check out your tomato recipe! Looks delicious and sounds super flavorful. I love the versatality of orzo and the different flavor combinations you can do to make every dish a different one! Gorgeous photos! So delicious and versatile too. Love the flavor combination. Definitely want to try this soon! YuM! I want to eat this right.now! Great flavor combo! I’ll be trying it soon. Looks delicious Debi! I love balsamic! oh yum! I love meals that taste great for lunch at work the next day. I must try this orzo recipe soon! I love orzo! This dish looks so pretty and the addition of tomatoes is a great idea. I just may have to try this tomorrow. I have a few tomatoes I need to use up and this looks like a perfect solution. I absolutely LOVE orzo and all of the ingredients in this dish! thanks for sharing!! So fresh and delicious! I love the texture of orzo, chewy and light like rice! Look at that gorgeous color! I love anything with balsamic roasted tomatoes!!! This sounds and looks amazing! Your pictures are gorgeous!! That looks fantastic. Thank you so much for sharing! I’ve never tried orzo before. This looks so good though! This Orzo looks divine. I have a box of it in my pantry. We have been looking for recipes to get us out of our supper slump. Thanks for the tip. That looks soooo yummy. I love rice. Actually, RockyMountainSavings, orzo is pasta and not rice. They look pretty similar but taste totally different. And, I like how easy it is to eat this pasta, not messy like spaghetti! It looks good to me. I’ve never tried Orzo, but I’d like to… bet I’d love it too. This must feel and taste good in the mouth. You took a beautiful photo and it makes me crave. I love the combination of fresh and dry spices you used. I’ve never had Orzo but this dish looks tasty! Especially with the Pine Nuts, they’re my favorite. I love Orzo. Looks incredible! i definitely need to be cooking with orzo more.. i love it!